Bus from Kuala Lumpur to Ayer Hitam is the most convenient and hassle-free direct bus service to travel between the two destinations. 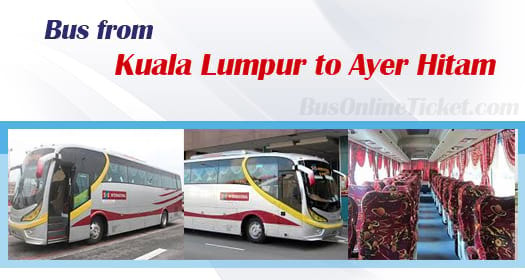 Many locals especially residents in Ayer Hitam who working or studying in Kuala Lumpur rely on this direct bus service. S&S International Express is the only bus operator offering bus service from Kuala Lumpur to Ayer Hitam. S&S International Express is a famous express bus company in Malaysia by providing comfortable and high-quality bus service within Peninsular Malaysia. Bus service from Kuala Lumpur to Ayer Hitam provided by S&S International Express run regularly at different intervals starting from early morning till night. The first bus service starts at 8.00am while the last bus service is 9.30pm. The average duration required for bus from Kuala Lumpur to Ayer Hitam is about 3.5 hours depending on the road traffic condition. At least one washroom break will be given during the journey because there is no toilet on board. The bus ticket price from Kuala Lumpur to Ayer Hitam is reasonably priced at RM 26.20. The pick-up point in Kuala Lumpur is located conveniently at the main transport hub in Kuala Lumpur, namely Terminal Bersepadu Selatan (TBS). When the bus arriving in Ayer Hitam, passenger will alight from the bus at Ayer Hitam Bus Terminal.